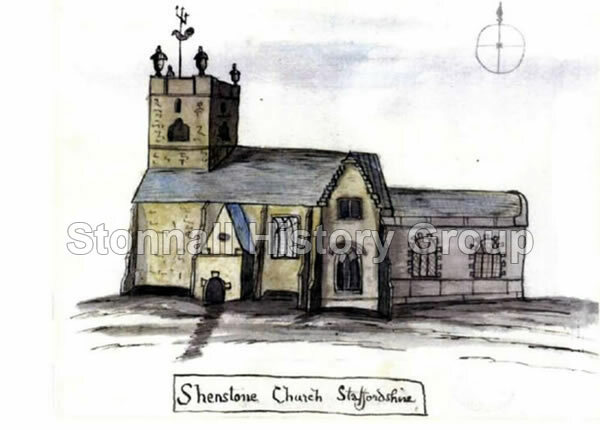 This study is intended to identify the location of St Peter's Chapel, Stonnall, Staffordshire. It will adduce all the documentary, historical, circumstantial and archaeological evidence that has so far been collected in an attempt to pinpoint the whereabouts of the site of the chapel with, I believe, 100% certainty. We will examine all the evidence item by item. In 1769, the former Curate of Shenstone, the Reverend Henry Sanders compiled his History and Antiquities of the Parish of Shenstone. At that time, Stonnall was a component part of the parish and thus his account contains a considerable amount of detail relating to the village and its neighbourhood. Moreover, this document contains the earliest known references to there having been a chapel and a chapel-yard in Stonnall. As we will see, Rev Sanders never saw the chapel, having relied on commonplace anecdotes about its existence. However, as we will see also, he did see the chapel-yard and, therefore, his account represents a primary documentary source with regard to that feature. The 1838 Tithe Map of the Parish of Shenstone and its Awards Book provide us with secondary documentary evidence. Although these documents contain no direct reference to the chapel, various details contained within them directly support the evidence relating to the chapel's existence and location provided by Rev Sanders' account. The site is located on the side of an eminence formerly known as Chapel Hill, to the immediate north of and directly adjacent to the structure known as the pinfold, between Church Road and Church Lane. The pinfold itself has one or two curious features which, as we will see, point to its having had a function that predates its undoubted use as a place where stray animals were impounded. Some time ago, I suggested that the discovery of building debris on the surface of soil at a credible location would point to the remains of the chapel. Co-incidentally, a chance remark was made by a local farmer, Alan Ramsell, while I was interviewing him in early February 2012 for source material for another article in the Memories of Old Stonnall series. At this time, in an off-the-cuff remark, he said that he had ploughed up brick fragments at the site now under investigation. I went to the site immediately and found brick and pottery fragments on the soil surface. I then checked the documentary evidence and found that this location conformed in every way with all the available information. Over-stonall, soon after the Conquest, was the property of the D'Oyleys, of which noble house lord Robert Fitz Nigel D'Oyley, in 1129, gave it to the abbey of Osney in the county of Oxford, by the name of one of the two 'Stonhala's, with their chapels; but, as other places are passed in the same charter, I am not perfectly satisfied that this town or hamlet [ie Upper Stonnall] had any chapel, that of Stonall inferior lying so near as half a mile, and therefore such a place of public worship seems unnecessary in Over-stonall. Here, Rev Sanders tells us that, according to a charter, Upper and Lower Stonnall, together with their two chapels, passed into the ownership of the D'Oyley family soon after the Norman Conquest and hence in 1129 to Osney Abbey. He then expresses his scepticism that Upper Stonnall ever had its own chapel, stating that the chapel in Stonall inferior (Lower Stonnall) was situated "so near as half a mile" thus rendering a chapel in the upper part of the village as unnecessary. On the other hand, he clearly has no reservations concerning the existence of the chapel in the lower part of the village. For him, St Peter's Chapel, Lower Stonnall had been a reality. Not only the people of this hamlet [ie Stonnall], but all the parishioners of Shenstone, have a tradition of a chapel in old times, situate in the upper part of it towards Thornes and the road leading to Upper-stonall, but mixed with fable. In this passage, Rev Sanders makes two points. The tradition of a chapel was common throughout the parish and, secondly, he gives us more locative information: remembering that he was speaking as a resident of the village of Shenstone, "the road leading to Upper-stonall" must be interpreted as Wall Heath Lane and "situate in the upper part of it towards Thornes" must be interpreted as somewhere along Church Road. Assuredly some charters, dated in the reigns of Henry I. and Stephen, take notice of such chapel or chapels in Stonall. There is, as a farther evidence of it, a piece of land called the Chapel piece, consisting of three acres and an half, divided into two parts, one the property of Thomas Stanley, of Thornes, the other of Thomas Adcock, of Lyndon [ie Lynn]. Around this are several enclosures, called by the names of the Chapel field, Chapel hills, Church fields, and Church leasows, which, most probably, were lands formerly appropriated for the maintenance of the clergymen who officiated at Shenstone church, or this chapel of ease to it, at Nether Stonall. In the upper part of Nether Stonall, near the chapel-yard, stands a very handsome new erected mansion, built by Thomas Dickenson, gent. of a family of some note, and long settled here. Remembering that, in the Old Days, Thornes was considered to be in Lower Stonnall, in 1769 there were very few buildings in that hamlet. The pound, the former chapel yard. Thus, this mansion is certainly a reference to Thornes House, which is only a few yards away from the pinfold. Probably, the most important and significant aspect of this passage is that he refers to the chapel-yard as though it still existed. ...nine closes called the Flatts, also Pit-close, Hillclose, Chapel-yard-close, Hook-close, lying near the lands of' Henry Dolphyn and Thomas Dickenson, gent. Here we note a reference to Chapel-yard-close. 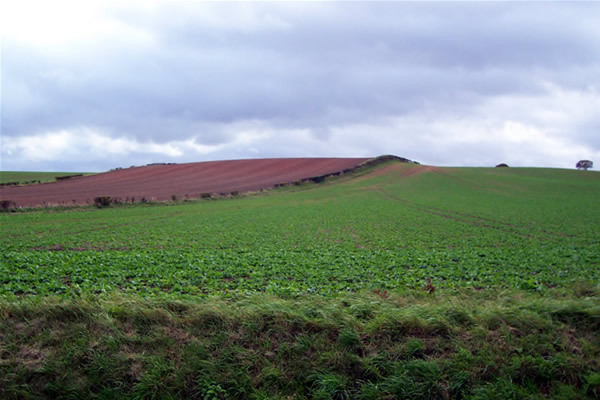 This would be the piece of land, or field, that enclosed the chapel site and chapel-yard. We note also this land was near the lands of Thomas Dickenson who, it seems, built Thornes House, which is just a few yards from the pinfold. The chapel was mentioned in several charters. Knowledge of it was firmly entrenched in local custom. The chapel was located about 1/2 a mile from Upper Stonnall. The chapel was located in Thornes on a road that we now refer to as Church Road. It was located close to Thornes House. The chapel-yard still existed in Rev Sanders' lifetime. The chapel imposed itself on the name of Chapel Hill and the names of various fields such as Chapel-yard-close. We will now turn to the Tithe Map and its associated Book of Awards. In the latter, we note that the two fields referred to by Rev Sanders as Chapel Hill were still marked as such in the early 19th century, some 70 or 80 years after Rev Sanders' account was compiled. One of them, property B44, had passed to Thomas Caddick, whereas the other, property B45, was still in the ownership of the Adcock family, belonging to one Samuel Clarke Adcock. A public footpath, of which more later, passed through one of the fields. This information provides us with solid evidence as to precisely where Chapel Hill was located. The area around the pinfold, according to the Tithe Map survey. Note the two Chapel Hill fields and the footpath (now lost) passing through them. Note also that the Tithe Map is orientated differently from modern maps. Turning now to the Tithe Map, we note that the area around the pinfold was exceedingly well served in terms of access by five converging routes: the upper part of Church Road, the lower part of Church Road, Church Lane, the footpath from Main Street and the footpath from Lower Stonnall (now lost). The location of Chapel Hill can be positively identified. The area around the pinfold was very easily accessed from many directions. He then goes on to explain that, following an Act of Parliament in the reign of Henry VIII as an attempt to make church administration more efficient and in accordance with a fairly complex legal formula, any chapel could be closed if its rateable value was below the value of £6. As the abbey of Osney was dissolved in the year 1539 all its lands and rights seized and passed to the crown, we may naturally conclude, there was little or nothing left for the support of the minister at Nether Stonall, if, indeed, he was a different person from the vicar of Shenstone. The South chancel of Shenstone church was built, it is said, of materials taken from Nether Stonall chapel, which is not unlikely, being different from the rest of that structure, and chiefly of brick-work ; and, as that chapel was dedicated to St Peter, there is a memorial of it in the work, namely, the keys which are generally given him, and of large proportion, with. two crosses, one in the form of that on which our Saviour suffered, the other a common one, framed of bricks burnt of a blue cast. In this chancel the lords of the scignory, named Fryths, had their seats, and in general the inhabitants of Thornes and the Stonall districts. 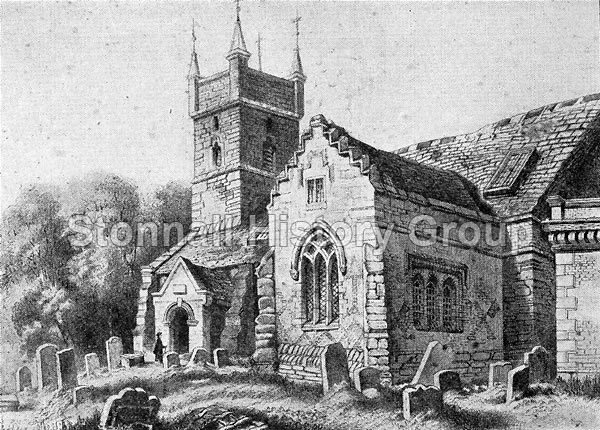 St John's Church, Shenstone as it appeared in 1784, the church that Reverend Sanders knew intimately - and a long time before it was rebuilt at a different location in 1850. The south chancel is pointing towards the observer, roughly in the centre. It was clearly made of bricks and different from the oldest part of the church, the nave and steeple, which appeared to have been made of sandstone blocks. This fully accords with Rev Sanders' description. Moreover, if the window parts of the Lost Chapel were recycled along with the bricks, this image may well present us with an insight into the appearance of the original structure in Stonnall. In other words, the site was cleared at some stage and some of its bricks were used to construct the south chancel of the church in Shenstone, which was used habitually by people from Thornes and Stonnall. Also, St Peter, to whom the chapel had been dedicated, was commemorated in this new piece of work. Another view of the south prospect of the old St John's Church, Shenstone, showing the transept or chancel known as St Peter's Chapel or the Stonnall Chapel. St Peter's cross keys are clearly visible. Source: from an early 19th century engraving, artist unknown. The chapel's fate was sealed as a result of King Henry's Reformation and the Dissolution of the Monasteries in the mid-16th century. The remains of the chapel were cleared away and recycled as part of St John's Church, Shenstone. The new chancel was the preserve of church-goers from Thornes and Stonnall. St Peter was commemorated in the new chancel. Bricks "burnt of a blue cast" were used. 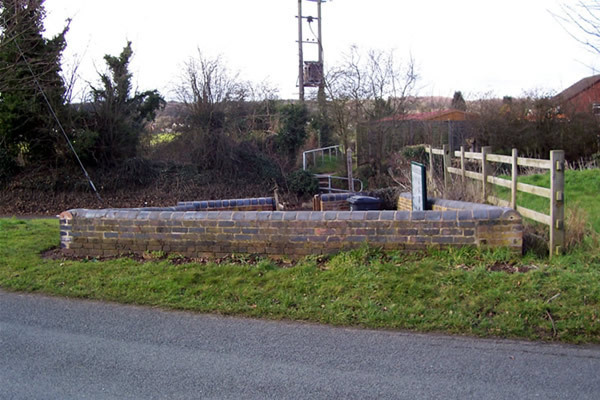 The pinfold area is about 1/2 a mile from the centre of Stonnall, as noted by Rev Sanders. It is more-or-less equidistant from Upper Stonnall, Lynn and Lower Stonnall. The shape of the area is useless with regard to agricultural productivity and hence a building at that location would not encroach on farming activities. Despite the shape of the area, there was plenty of room for a small chapel. It was easily accessible with five converging routes. From all the foregoing, it is possible to build a hypothetical timeline relating to St Peter's Chapel. At an unknown date, a chapel dedicated to St Peter was built in Stonnall. With a high degree of certainty, because all the documentary evidence points to it, we can postulate that it was erected at the location now under investigation. We know that it was built to some extent from bricks because Rev Sanders says so explicitly. The structure now known as the pinfold had once had an earlier function as the chapel-yard. The chapel was closed as a result of the Reformation in the mid-16th century. The chapel was demolished at some stage and the site was cleared, the remains being recycled at the church in Shenstone. The pinfold was improvised from the chapel-yard. It is now necessary to turn to archaeology in order to confirm this hypothesis. To determine whether a building had once occupied the area. To find good dating evidence. As we will see, both of these objectives were attained. The test pit at the site containing several sandstone blocks lying on the subsoil. It should be noted here that we did not attempt to investigate the pinfold physically. It is a monument and we could not and would not do anything to compromise its structural integrity. Between 9am and about 10.30am, we conducted a metal detection investigation of the site. A number of finds were made and these are listed below. We then dug a test pit. 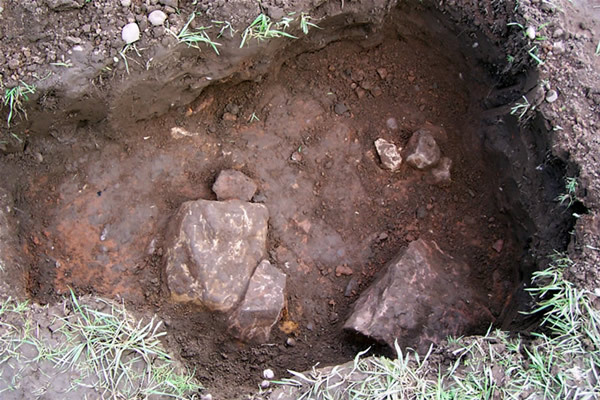 The soil was approximately 40cm deep and the lower 15cm or so of it was highly compacted, indicating that it had not been disturbed for very many years. There were many fragments of brick in the soil. The subsoil at 40cm was very sandy and, lying on that, we found two large blocks of sandstone and one smaller such block. These were surrounded by a lot of brick debris along with lime mortar. A further three stones were uncovered. These were very flat and smooth river cobbles and not at all like the cobbles commonly found in the soil around Stonnall. 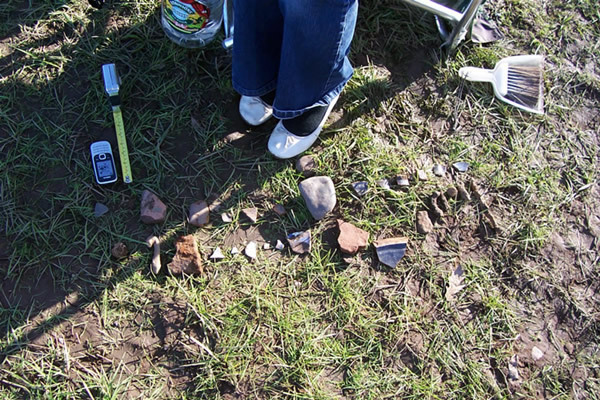 The finds, including pottery, tile, brick and mortar fragments, nails and glass. A piece of coloured glass and various fragments of pottery and tile were recovered from the pit. We metal detected in the pit periodically and a number of nails were recovered. A shoe buckle was also recovered during this operation and this would be our primary dating evidence. The shoe buckle, dated to between 1620 and 1720. 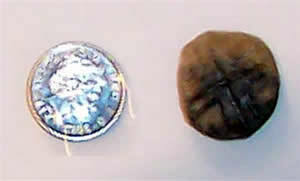 Above right, a coin-like metal disc found in the excavation spoil. It is quite clearly engraved with a Christian-style cruciform design. It is thought that it is probably a crude example of a church token. These artifacts were quite common in the Middle Ages and could be used in exchange for goods and services and were, in turn, redeemed against a priest's charges for weddings, baptisms, funerals, etc. The disc is about the size of a 5 pence coin (shown above left). There can be no doubt that a building once stood at this location, given all the construction material debris. The building seems to have been of quite sophisticated construction, with sandstone, brickwork, tiles, timber and glazed windows. The river cobbles may well have been used as flooring material. The location matches that of St Peter's Chapel as indicated in the documentary evidence. The pinfold was improvised from the chapel-yard. 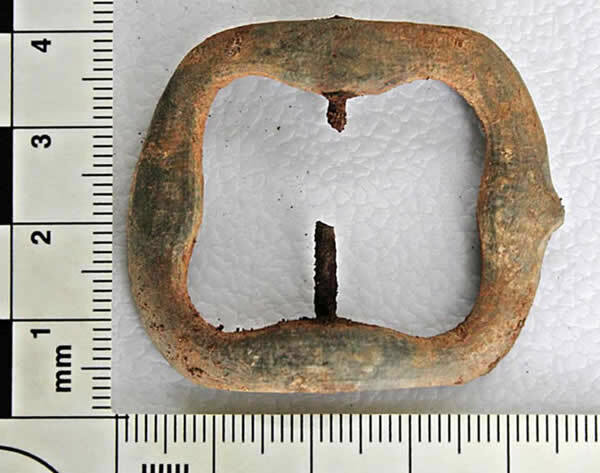 The shoe buckle has been dated to 1620 - 1720, giving us a good dating period for the clearance of the site as having taken place well before Rev Sanders' incumbency. 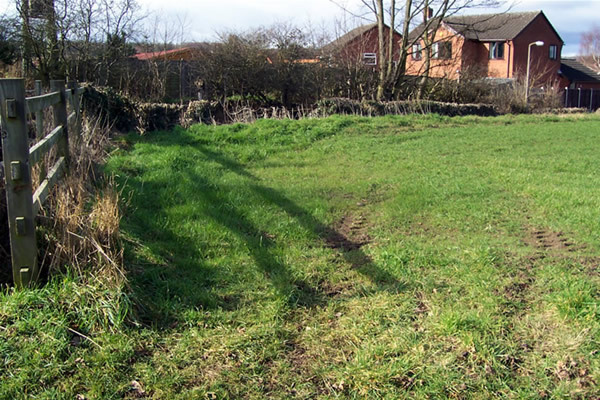 Dear reader, I present you with the site and some of the remains of the Lost Chapel of Stonnall. 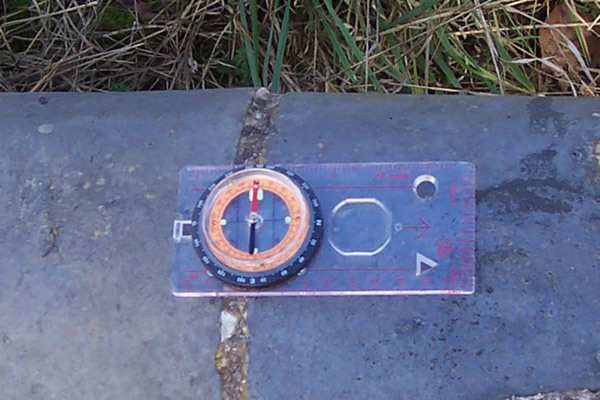 Finally, as mentioned earlier, the pinfold has one or two curious features, the most important of which is that its north wall is east-west orientated, as shown from the compass reading in the photograph below. This orientation is the convention for a Christian place of worship. The orientation of the pinfold's north wall. While we were metal-detecting the site, we noticed that many of the brick fragments that we found gave a strong magnetic response. We assumed that the clay from which they were fabricated had a mix of naturally-occurring iron ore particles. This was annoying initially because, in the hope of finding metallic objects that would provide dating evidence such as the shoe buckle above, we were getting a lot of false readings. However, it then gave us the idea of testing the bricks from some nearby structures to see whether they too might share this somewhat unusual property. If this proved to be the case, it might indicate a shared time and place of manufacture. We were aware that most of the pound's bricks were not part of the original structure. Some had been introduced when it was reconstructed in about 2000. Therefore we tested only the original courses of bricks. All these bricks gave a substantial magnetic response. When we tested these bricks, a very large proportion of them responded magnetically. A close look at the bricks of this wall revealed that at least three different types of bricks were used. Furthermore, it is clear that all were recycled, many of them having been damaged to some extent before the wall was built. It is obvious that the bricklayer had filled in some gaps with mortar to cover the damage. It is also obvious that the wall has never been pointed. New mortar always has a different colouration and a different application style from the original and these factors are completely absent, indicating that remedial work has never taken place on the wall that might otherwise account for gap-filling. Clearly, there is a link between the bricks at the three locations. What could account for this? The Fryths erected another, which seems not older than the days of king William III. mostly of brick, and strong. There had been a dwelling by the name of Thornes Hall since at least the time of Edward IV, who became King in 1461. The house had been refurbished or rebuilt at several stages over several centuries. The house and various associated structures were made of bricks. From this we can conclude that, because the house and other structures had been been built and rebuilt over many centuries, different types of bricks were employed at different stages of development and redevelopment. Although there appears to be no surviving images of Thornes Hall, we know that it was huge. When the Hearth Tax was levied between 1662 and 1689, the house was recorded to have more chimneys than any other property in Stonnall and Lynn. By about 1830, Thornes Hall was untenanted and in a state of disrepair. At that time it was owned by William Leigh, who had manorial rights based at Little Aston Hall. After he had decided to demolish it, we know from White's Directory of the time that he also decided to recycle the left-over materials. As to who supervised this work, we can guess that he was John Mellor, Mr Leigh's estate manager. We also know from the same source that much of the recovered bricks were used to build a new school and master's house at a former sandpit near the church. It is a virtual certainty that any bricks of poorer quality and thus from earlier phases of construction and reconstruction work over the previous centuries were used to build the roadside boundary wall. The bricks with the magnetic response would have been among them. ...the chapel of ease to Thornes Hall. From all these details, we can now construct a theoretical narrative of the pivotal events relating to Thornes Hall, St Peter's Chapel and the pinfold. By around the 15th century, business at Thornes Hall was booming and its owners could afford a few expensive self-indulgences. These included the reconstruction of the house with bricks - a relatively new and, no doubt, high status building material in the England of the Middle Ages. At the same time, they financed the building of St Peter's Chapel a couple of hundred yards down the road - and the same - and as it turns out, magnetically active bricks were used for both the house and the chapel. At this time the Thornes Hall residents were the tenants of Osney Abbey which had owned the whole manorial estate of Shenstone since the 12th century. Following Henry VIII's Dissolution of the Monasteries, the abbey surrendered its assets to the Crown in 1539. It seems that ensuing legal and financial difficulties forced the chapel to close its doors. The building remained on the landscape however. Possibly at the same time as the north transept of Shenstone Church was built or modified in 1647, a decision was made to dismantle the chapel in Stonnall and then re-erect it as St John's south transept. When the site was cleared, it was inevitable that a certain amount of rubble and other waste materials were left behind. This is what we found when we investigated the area. And among that we found magnetically active brick fragments. We now turn our attention to the pinfold. Rev Sanders makes no mention of it, but he notes the presence of the chapel yard at the same location in the present tense. We contend that the pinfold was improvised from the former chapel yard, which would have been constructed at the same time and from the same materials as the chapel. That is why many of its bricks give a magnetic response. Design, programming and image editing are the work of the author.